Are you going away for the holidays? 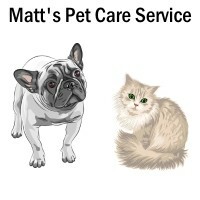 Let Matt's Pet Care Service care for your beloved pets, while you are away. Matt will visit them once or twice a day to feed and share some love. He has been caring for people's pets since 2012. Contact Matt's Pet Care Service for rates and references.